ASIFA-ATLANTA: GODAM Comedy Extravaganza, with Fluidtoons! GODAM Comedy Extravaganza, with Fluidtoons! 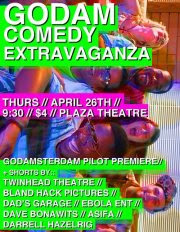 Come to the Plaza for collection of grade-A comedy shorts from the funniest filmmakers in Atlanta! Bring an extra pair of pants. Thursday, April 26th at 9:30. Doors at 9:00.